Home > Bacteria & the Lungs > How Does Legionnaires Disease Spread? Legionnaire’s disease is caused by the bacterium Legionella pneumophila. This causes upper respiratory infections that sometimes resemble pneumonia and sometimes resemble flu. Transmission and spread of the bacteria occurs in aerosols - this is an aquatic bacterium that survives best in warm water or in very moist warm environments. The ideal places for it to thrive, apart from the human respiratory tract, are the condensers in air conditioning units, and in places where a lot of hot water is stored, such as for communal showers and spas. Humidifying machines and building systems can also harbour Legionella. When air conditioning of humidifying systems are operational, they circulate air that contains fine droplets of water through a building. If the water source is contaminated with live Legionella, the droples of water will be packed with bacteria and these can be easily inhaled. Once the few bacteria enter the airways and lungs, they can start to divide and can quickly cause human disease. Legionnaires disease is the most well known form of legionellosis and also the most severe. 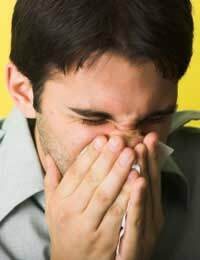 If infection causes disease symptoms these include a cough, fever, aches and pains, lethargy and weakness and a loss of co-ordination, and the condition usually progresses to pneumonia. This form of the disease can have a death rate as high as 30 per cent, and is more dangerous in the elderly or in people whose lung function is already impaired. Heavy smokers are most likely to experience severe infection with more serious symptoms. Legionella pneumophila also causes Pontiac fever, which is a lot milder and is limited to flu-like symptoms that last for a few days. Some people become infected with Legionella bacteria and show no symptoms at all. Legionnaires disease and Pontiac fever were not recognised until 1976. The first recorded cases of Legionnaires disease were in July 1976 when 221 military veterans attending an American Legion celebration of the US Bicentennial were diagnosed with pneumonia. Thirty-four of them subsequently died. This was a significant event and so unusual that it warranted further investigation. The outbreak of illness made headlines and wild theories of an outbreak of swine flu, an act of bioterrorism and accidental poisoning were put forward. When the hotel was scrutinised, the causative bacterium was found and identified. It had never previously been described, so the names Legionella, legionellosis and Legionnaires disease were chosen, after the American legionnaires who had been so badly affected. The link to the air conditioning system in the hotel where the victims were staying made people look again at how such systems operated and global regulations were completely overhauled as a result. Outbreaks of legionellosis are less common in countries with a cooler climate as air conditioning is not as widely used as in the hot-weather states of the US. However, the UK has not escaped completely. A large outbreak occurred in August 2002 at Barrow-in-Furness in Cumbria in which 180 people became ill. Seven of them died. A public investigation was held and the source of the infection was found to be a leisure centre in the centre of the town. One of the cooling towers for the air conditioning system had become contaminated with Legionella. The design was found to be at fault and the architect was eventually fined. The town’s borough council was also fined, but this was a lesser punishment than expected since the council was originally charged with corporate manslaughter.